Do Angioplasty and Stents Improve Survival? The insertion of a stent, a small mesh tube that holds the vessel open and prevents the blockage from re-forming. While the procedure is pretty straightforward and relatively easy to comprehend, can it actually increase life expectancy or improve one's chance of survival? In response to this oft-asked question, a research team funded by the Veteran Administration's Reseach and Development Unit compared outcomes in persons provided optimal medical therapy (OMT) to treat their CAD to those provided both OMT and PCI. Dubbed the COURAGE (Clinical Outcomes Utilizing Revascularization and Aggressive Drug Evaluation) trial, the 2007 study concluded that persons provided OMT alone did not have any greater risk of heart attack or death than those offered OMT and PCI. Moreover, PCI did not offer any advantage over OMT in alleviating symptoms of angina. The followup in 2015 further confirmed these results. 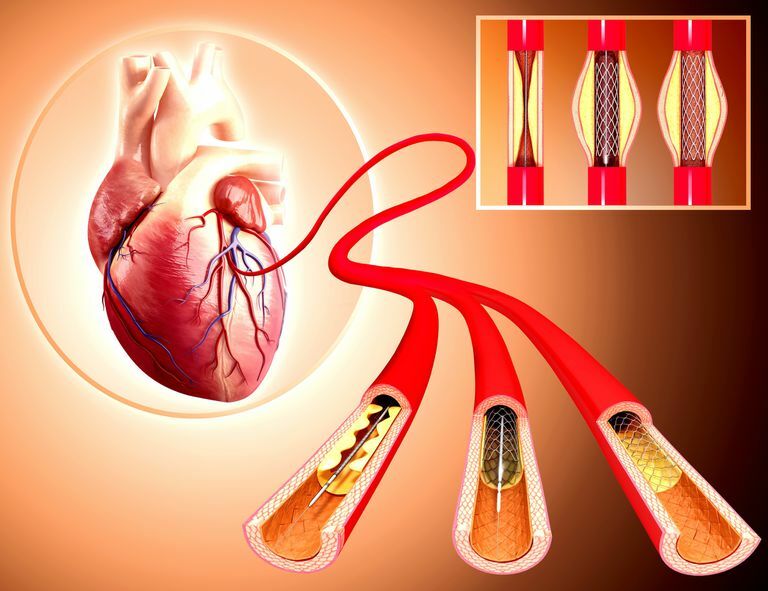 The results were surprising to many in the medical community who had long considered PCI advantageous to those with severe arterial blockage. It was only after examining the behaviors of the patients—as well as the limitations of the procedure itself—that the researchers were able to explain the findings. Persons who underwent a PCI usually returned to their previous dietary habits once at home (including the excessive consumption of red meat and unhealthy fats). The PCI itself tends to injure the artery wall and increase the risk of secondary obstruction. In fact, 21 percent of the PCI group required another stent within six months, while 60 percent of the treated vessels required re-stenting. The PCI procedure was also associated with a greater risk of bleeding complication, heart attacks, and stroke, effectively erasing many of the benefits of treatment. Another important factor is that the plaques treated in a PCI are not the ones that are most likely to cause a heart attack or stroke. Rather, the concerns are related more to the non-obstructive plaques that are softer, less stable, and far more likely to rupture. While angioplasty and stenting may provide short-term relief, the major burden of the disease remains intact as well as the risk of future cardiovascular events. The shortcomings also extend to medical practices. A 2010 evaluation of the COURAGE trial reported that fewer than 45 percent of patients with CAD underwent stress testing prior to an elective PCI. What this suggests is that many doctors failed to address other modifiable factors, such as diet and exercise, prior to offering the procedure. Because of this, many people may have been less aware of the need to alter the behavior, including the cessation of smoking, once they were released from care. As a result of the COURAGE trial, the American Heart Association and American College of Cardiology published guidelines outlining the appropriate use of PCIs in people with heart disease. They stress lifestyle changes and the appropriate use of medications in first-line treatment where the heart condition is stable. The guidelines also affirm the need to ensure that a person is fully adherent to treatment before even considering a PCI. In a great many cases, an improvement in adherence directly corresponds to an improvement or stabilization of the heart condition. To this end, if you have heart disease, you should never view a PCI as a "quick fix." The more long-lasting solution will always be routine exercise, a well-balanced, low-fat diet, and the optimal adherence to your chronic medications. Boden, W.; O'Rourke, R.; Teo, K. et al. "Optimal medical therapy with or without PCI for stable coronary disease." N Engl J Med. 2007, 356:1503-16. DOI: 10.1056/NEJMoa070829. Desai, N.; Bradley, S.; Parzynski, C. et al. "Appropriate Use Criteria for Coronary Revascularization and Trends in Utilization, Patient Selection, and Appropriateness of Percutaneous Coronary Intervention." JAMA. 2015; 314:2045-53. DOI: 10.1001/jama.2015.13764. Finn, A.; Nakano, M.; Narula, J. et al. "Concept of vulnerable/unstable plaque." Arterioscler Thromb Vasc Biol. 2010; 30:1282-92. DOI: 10.1161/ATVBAHA.108.179739. Levine, G.; Banks, E.; Blankenship, J.; et al. "2015 ACC/AHA/SCAI Focused Update on Primary Percutaneous Coronary Intervention for Patients With ST-Elevation Myocardial Infarction.." Circulation. 2015; 87(6): 1001-19. DOI: 10.1161/CIR.0000000000000336. Sedlis, S.; Hartigan, P.; Teo, K. et al. "Effect of PCI on Long-Term Survival in Patients with Stable Ischemic Heart Disease." N Engl J Med. 2015; 373:1937-46. DOI: 10.1056/NEJMoa1505532.